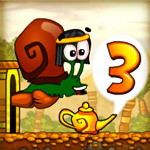 Description: Snail Bob 3, HELP! Snail Bob is in a hot spot -- the desert. You gotta get him out!